Rita Mae Brown and Sneaky Pie Brown have just graced us with the 20th anniversary Mrs. Murphy mystery. Since cats don’t usually live as long as humans do, I find myself worrying about Sneaky Pie’s advancing age. If this latest book is any indication, though, the cat is still on her writing game. And if Sneaky Pie does move on to Cat Heaven at some point, I have no doubt that Rita Mae Brown can find a new kitten for a writing partner. 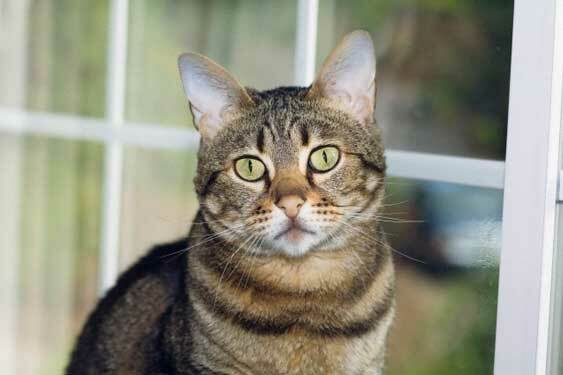 We are told that she rescued Sneaky Pie from her local SPCA in Virginia. Unfortunately, shelters always seem to have plenty of kittens looking for good homes. THE BIG CAT NAP. 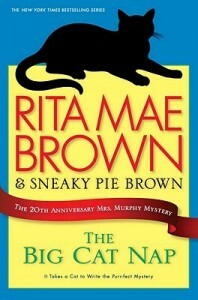 By Rita Mae Brown and Sneaky Pie Brown. Bantam. 224 pages. $26. It takes creativity and a curiosity about life that befits a cat to keep a series fresh through 20 mysteries. You’d think there would be only so many people to be murdered and so many ways to bump them off in and around the quiet village of Crozet, Va. But Rita Mae Brown and her feline collaborator, Sneaky Pie Brown, are interested in many things that yield opportunities for dastardly deeds. This time out, their human heroine, Mary Minor “Harry” Haristeen, puts her love for and knowledge about motors and vehicles to work. There’s been a rash of odd vehicular mishaps, some relatively minor, others much more serious. Some things just don’t add up. And then Harry stumbles upon a dead mechanic at a popular local repair shop, his head bashed in. Of course, Harry starts asking questions and poking her nose into dark corners, despite the warnings of her human and animal friends. And of course, before things are settled, Harry’s curiosity will put her in danger. Longtime readers will be interested to find that there’s a new twist to the old plot standard that involves Harry’s beloved corgi Tucker and two cats, Mrs. Murphy and Pewter, rushing to her rescue. Another way the Browns keep these books fresh is by letting Harry and her friends and associates have real lives rather than become more or less frozen in time and situations. Over the 20 books, we’ve seen Harry leave her job at the post office, remarry her ex-husband, fight breast cancer and help her small-town friends deal with changes in their lives. The folks in Crozet and its environs grow up, get married, change partners, have babies and confront new trends in society, as do people anywhere. They just find a lot more murders in the mix than do the residents of most small Southern foothills towns. In case there are any readers out there who have not yet discovered this series but think they might want to give it a try, I always feel a need to explain that the Mrs. Murphy series are not like other mysteries. There is that matter of the talking animals – not just Harry’s pets, but also their associates, including wild animals such as the barn owl and the snake that likes to hang from a tree in the yard. These animals don’t nudge and bark or meow in efforts to warn their humans: They converse with one another in good English. We readers understand their conversations, but the book characters do not. This device can help propel the plot, and it also provides a good bit of amusement as the animals comment on the human world. If you’ve ever wondered what your pet would say if it could talk, you should enjoy these books. If talking animals and a bit of social or political commentary turns you off, be warned. If not, join the many happy fans of the Mrs. Murphy books in enjoyment of the 20th installment. At my house as at many others, new Mrs. Murphy books have become one of the most welcome signs of spring. This entry was posted in Mysteries, Southern Fiction and tagged cats, dogs, Mystery, Rita Mae Brown, Virginia. Bookmark the permalink.